Download Catalog #39 PDF: Click to download (requires Adobe Acrobat Reader). Printable in B&W or color! 1952 Aurora 88K PIF in fully covered Gold-filled cap & barrel (quite rare). Entire barrel slides off to access built in piston mechanism (not a converter). 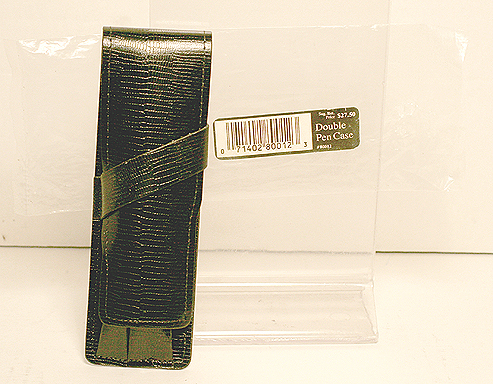 Clip has perfect black enamel insert and chromed “jewel” at the very top and bottom. Strong imprint and serial number on the section. The 88K was produced from 1952-1958. Some normal minor surface scratches, otherwise near mint. Medium/Fine point. No dents, dings or brassing. 1963 Aurora GL “Grand Lusso” PIF Set with solid 8K gold caps. This was the model above the “88.” Cap has alternating 3 pinstripes and plain panels. The PIF mechanism has a special device, dubbed the “riserva magica” that insures the last drop of ink is used (same mechanism Aurora used in the “98”). The cap top is slanted forward with black insert. Fine point. Close-up Photo: Near mint+ in original box with instructions and guarantee. 1963 Aurora Ball Pen for above set. 1925 Conklin Endura Vest Pocket LF in Black Hard Rubber (rare model!). GFT. Very unusual short model, but still sporting the wide cap band found in the Sr. size models! Cap & barrel set off with inlaid red bands. Fine point. A bit of rubber oxidation, and just a tad of imprint wear (fully readable) otherwise near mint. 1927 Conklin Sr. Endura LF in Cardinal. GFT. Cap and barrel both set off with inlaid blue bands. Medium/fine nib. Some imprint wear (fully readable), otherwise near mint. 1927 Conklin Sr. Endura LF Long Model in Black. Cap and barrel both set off with inlaid red bands. GFT. Rare model with extra-long cap and extra-long section. Medium, flexible, italic nib. Near mint. A wonderful and rare pen! 1927 Conklin Letter Opener in Black & Jade Celluloid. Not shown full size – is 8 3/4″ long! Near mint. 1931 Conklin Nozac Oversize 14-sided PIF with 7M Word Gauge in Green Pearl with black vertical striping. GFT. Medium nib. A tad of clip brassing at the ends, otherwise near mint. 1938 Conway Stewart 286 LF in Aqua Blue Reversed Cracked Ice (black veins). Extremely rare and beautiful Celluloid. Set off nicely with a black derby and barrel bottom. Medium/broad, flexible nib. New-old-stock, mint. 1951 Conway Stewart 28 LF Set in Blue Pearl Marble. GFT. Medium, flexible nib. Close-up Photo: New-old-stock, mint in original box. 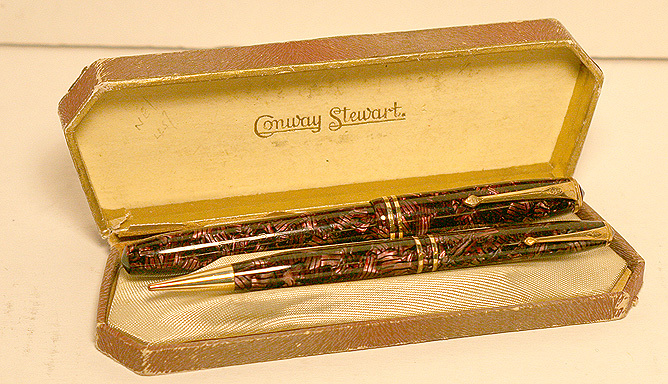 1951 Conway Stewart Pencil for above set. 1951 Conway Stewart 24 LF Set in Mauve Pearl Hatched (Lavender Web) (rare color). GFT. Medium nib. Close-up Photo: New-old-stock, mint in original box. 1951 Conway Stewart 100 LF in Black. 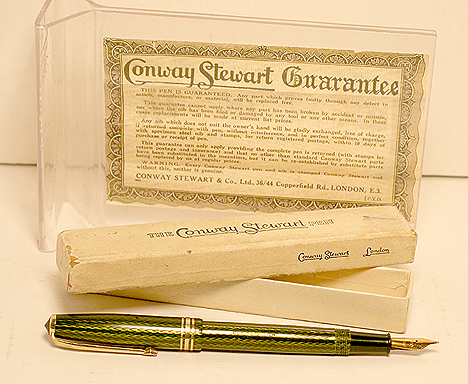 The largest Conway Stewart pen of the era. Highly sought by collectors. Medium nib, with a tad of flex. Close-up Photo: New-old-stock, mint in original box with instructions. 1951 Conway Stewart 27 LF Set in Silver Pearl Web (beautiful). GFT. Note the extra-wide cap band. Medium, flexible nib. Close-up Photo: New-old-stock, mint in original box. 1951 Conway Stewart 27 LF in Cracked Ice. GFT. Medium nib, with a tad of flex. A rare and highly sought after pattern. New-old-stock, mint. 1954 Conway Stewart 84 LF in Blue Marble. GFT. Medium/Broad nib. Close-up Photo: New-old-stock, mint in original box. 1956 Conway Stewart 93 LF in Green Herringbone. GFT. Close-up Photo: New-old-stock, mint in original box with instructions/guarantee. Broad, flexible, italic nib. 1925 Good Service #8 LF in Cardinal. GFT, clip with “Floral” pattern. Black ends. Lathed cap band. “Warranted” 14K #5 medium, flexible nib. 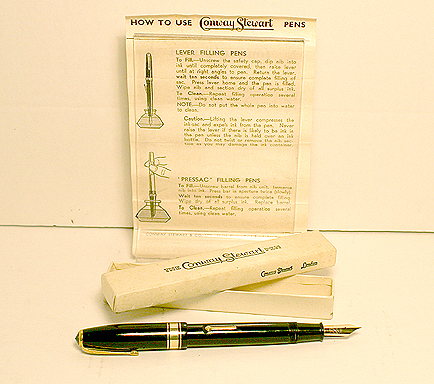 Good Service was a Chicago based manufacturer, although this pen (as most of their flat-top pens) was probably actually manufactured by National Pen Products, also of Chicago. Just a tad of wear to the left side of the barrel imprint (fully readable), otherwise near mint. 1925 Grieshaber #8 LF in Burgundy. GFT. A very high quality Chicago based pen manufacturer. 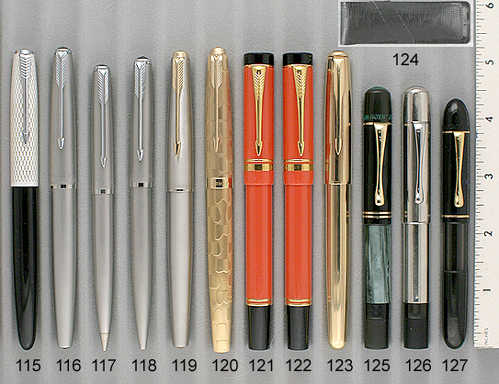 Grieshaber didn’t have the marketing budget to compete nation-wide with the majors, but certainly had a wonderful regional reputation for making excellent and beautiful pens. Note the extra cap bands and black cap derby. Medium/fine, flexible nib. A tad of clip ball and band brassing, otherwise near mint. 1940 Hunt Pen Company #8 size Speedball Auto-Feed Pen Holder LF in Black. GPT. 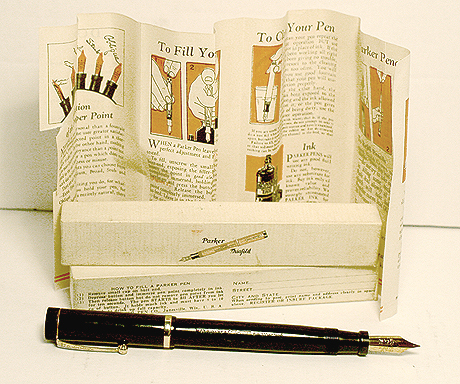 Used with replaceable drawing and lettering nibs (comes with one nib, marked “B-4”). Mint in original labeled plastic tube. 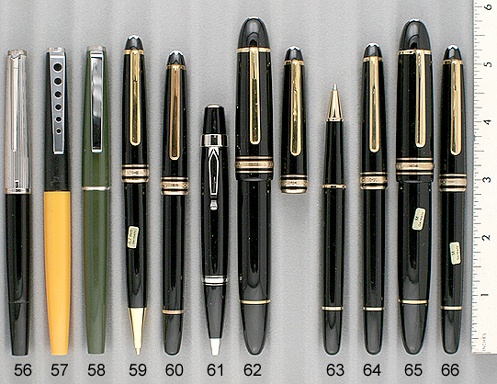 1938 Kaweco Elite 183A PIF Set in Black Chased Plastic. GFT. New-old-stock, Close-up Photo: Mint in original brown leather zipper case (zipper not working). Broad, flexible, italic nib. 1938 Kaweco Pencil for above set. 1925 Mabie Todd Pencil for above set. 1935 Montblanc 4 BF in Coral Red (rare). GFT. Fine, extra-flexible, italic nib. Could be new-old-stock, certainly in near mint++ condition. 1935 Montblanc 4 BF in Coral Red (rare color). GFT. Medium/fine, flexible nib. Near mint. 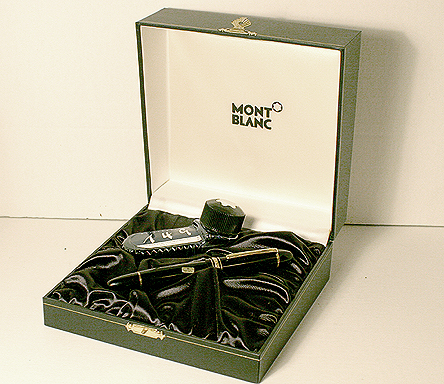 1936 Montblanc 232 PIF in Black. GFT. Short visualated window. The remainder of the barrel is slightly translucent due to wear of the black coating. Fine point. Incorrect blind cap (marked “432”). Some clip brassing. Nice pen for everyday use. 1946 Montblanc 244 PIF in Black. GFT. Visualated barrel window. Somehow I have accumulated five of these! So, I am putting them on sale. Normally $425, I am offering them now at $325! Nibs available: fine, flexible (2); extra-smooth, medium, extra-flexible; medium, flexible, italic. 1946 Montblanc 46 Twist Pencil in Black. GFT. Matches pen above. 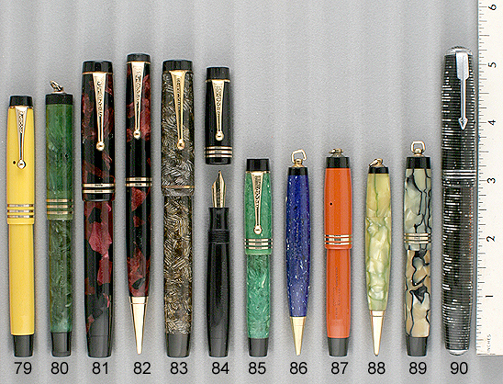 Buy with any pen above at $375 for the set. 1946 Montblanc 242 BF in Green Marble. GFT. Montblancs in color are rare. Medium, flexible nib. 1955 Montblanc 204 BF in Coral Red. GFT. Coral Red Montblancs are rare. Fine, flexible nib. Near mint. 1955 Montblanc 214 BF in Coral Red. GFT. Montblancs in color are rare. Medium, flexible nib. A tad of brassing to the clip ring. Barrel a shade darker under the cap. Medium, flexible, italic nib. Excellent. 1959 Montblanc 142 PIF in black. Early celluloid model. The celluloid piston fill 142 was replaced in the 1970s with injection molded resin, and replaced once again by a cartridge/converter fill model. GFT. Medium/fine, triple-flexible nib. Very slight posting mark on barrel, otherwise near mint. 1959 Montblanc 149 PIF in Black CELLULOID (not precious resin!). All the trim is Gold-filled, except the outer cap bands which are in Sterling Silver. Visualated barrel, triple telescoping piston unit. Highly desirable and collectable. Extra-smooth medium nib. Near mint. 1976 Montblanc 310 cartridge/converter fill in Olive. CPT. Converter not included. Slightly used, but condition still near mint. Fine point. 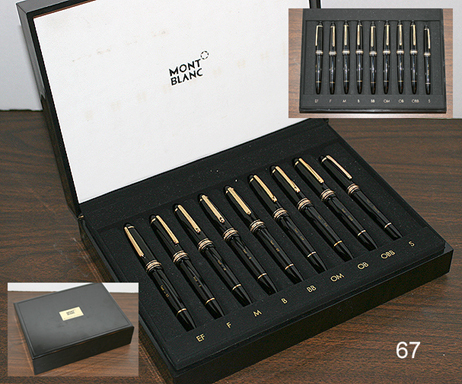 1990 Montblanc 146 PIF Store Nib Sample Set. 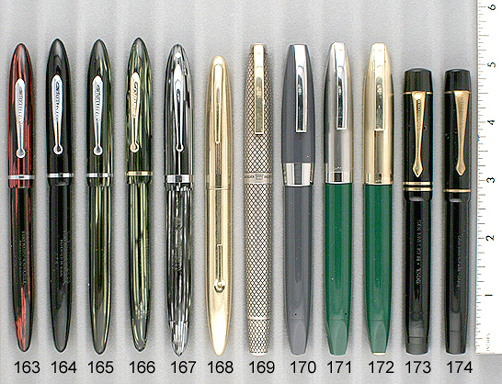 Contains (8) 146 and (1) 144 pen, each fitted (and individually marked) with a different nib. Extra-Fine, Fine, Medium, Broad, Double-Broad, Oblique-Medium, Oblique Broad, Oblique-Double Broad, and Special (tipped with a large ball of iridium). 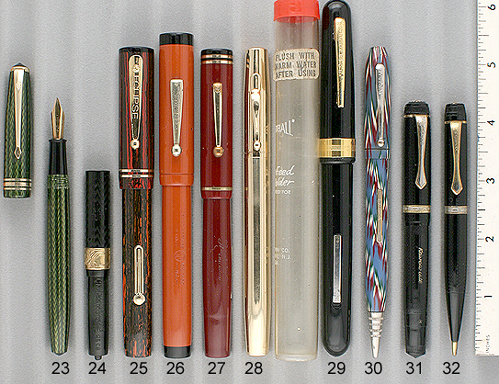 All the pens are piston-fill, new-old-stock, mint and unused. The box has some signs of age here and there. Black wood (ebony?). As you can imagine, these sets are awfully scarce, especially with mint pens. I’m told that the set was also produced with eight rather than nine pens, and this nine-pen version (which includes the “Special” pen) is the rarer of the two sets. 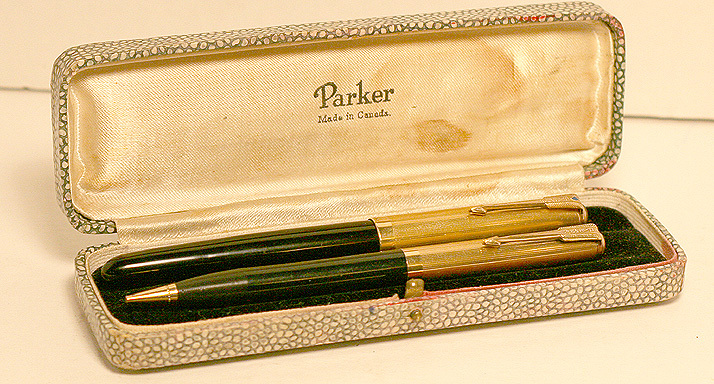 1923 Parker Pencil for above set. 1923 Parker Duofold Sr. BF in Black Hard Rubber (much rarer than the later plastic models). GFT. Rare model, only manufactured for one year – the second year of production — and has the "medium" size barrel imprint (the 1922 imprint was larger while the 1924 imprint was smaller – Parker finally settled on the smaller imprint). Medium nib. The imprint is deep and crisp. Close-up Photo: New-old-stock, mint in the original box with instructions. 1924 Parker Duofold Big Bro Pencil in Cardinal Hard Rubber. GFT. Matches the early hard rubber Duofold Sr. “Big Red.” This model has the rare, chased derby. A few minor scars in the derby, otherwise near mint. 1926 Parker Pastel BF ring-top in Coral (rare color). Medium, flexible nib (flexible Parker nibs are hard to find!). A tad of brassing to the lower edge of the cap band, and a bit of darkening to the bottom ½” of the barrel (all reflected in the price). Excellent. 1928 Parker Duofold Jr. BF in Mandarin Yellow. GFT. Medium/broad nib with a touch of flex. Incredible near mint++ condition! 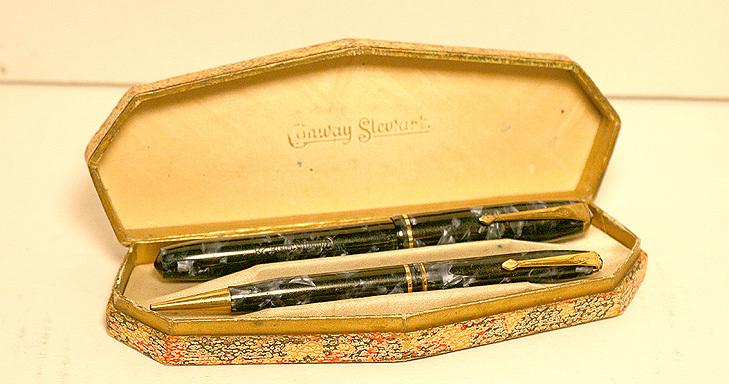 1930 Parker Pencil for above set. 1941 Parker Duofold Sr. BF in Bronze Pearl Lined “web” pattern. Quite rare. UK made. Medium nib. Near mint. 1932 Parker Duofold Vest Pocket BF in Black & Pearl Moderne. Just the slightest barrel ambering, otherwise near mint+. Medium nib. 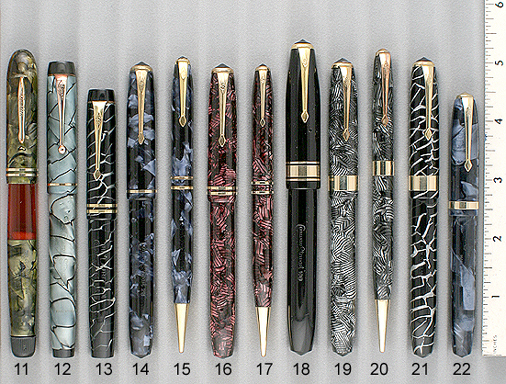 1935 Parker Vacumatic Jr. Set in Grey Marble. Highly translucent barrel! NPT. BROAD, FLEXIBLE nib (hard to find in a Vacumatic). Double-jeweled model. Near mint. 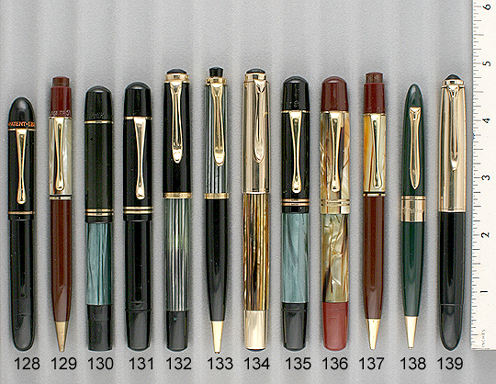 1935 Parker Pencil for above set. 1937 Parker Vacumatic Standard in Silver Laminated. NPT. Medium, TRIPLE FLEXIBLE nib! Double-jeweled model with 3 cap bands. Near mint. 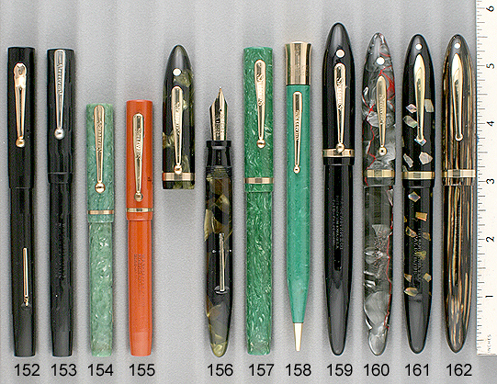 1943 Parker Vacumatic Major in Green Laminated. GFT. Two-toned, medium, ITALIC nib (hard to find). Canadian made. Just the slightest bit of wear to the patent date, otherwise near mint. 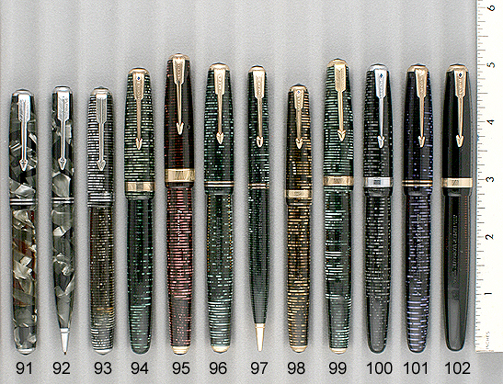 1940 Parker Vacumatic Jr. Set in Green Laminated. GFT. Double-jeweled model. Excellent barrel transparency. Medium/fine nib, with slight flex and an italic flair. Near mint. 1940 Parker Pencil for above set. 1942 Parker Vacumatic Debutante in Golden Laminated. Double-jeweled model with the “Chevron and arrow” cap band. Near mint. 1944 Parker Vacumatic Major in Silver Laminated. NPT. One-tone, medium nib. Nice crisp barrel imprint. Near mint. 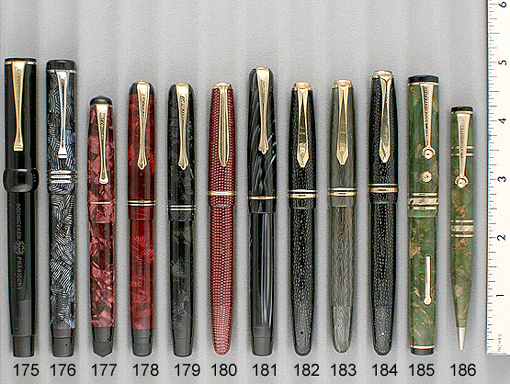 1945 Parker Vacumatic Jr. In Blue Laminated. GFT. Fine point. Near mint. 1946 Parker Vacumatic Major in Silver Laminated. New-old-stock, mint with original label, and still in original cellophane wrapper! NPT. Fine point. 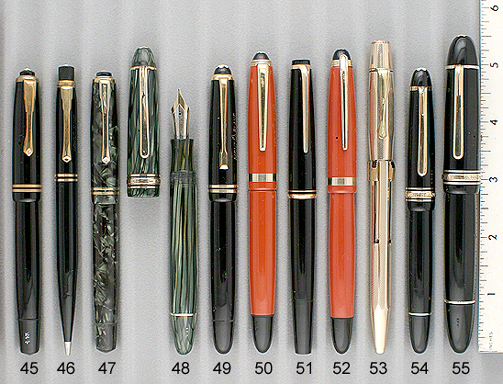 1947 Parker 51 Vacumatic-fill Set in Black with fully pinstriped GF caps. Manufactured in Canada. Extra-smooth medium nib. Close-up Photo: Near mint+ in original cobra-snakeskin black velvet lined box. 1947 Parker Pencil for above set. 1948 Parker Parker 51 BUTTON FILL in black with brushed Lustraloy cap. This is the famous “Red Band” filler made for just a short time. Working perfectly and near mint. Medium/fine nib. 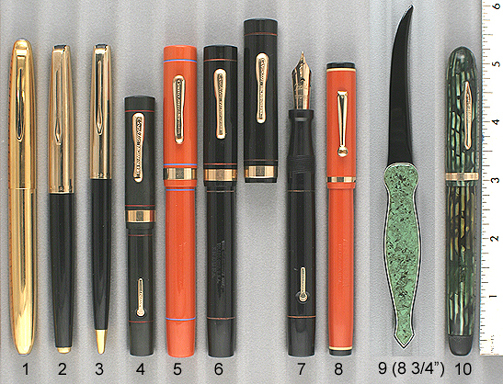 1950 Parker Pencil for above set. 1970 Parker 61 Aerometric (not wick) fill 3-Piece Flighter Set in Stainless Steel. Rare model with two inlaid dots in the shell rather than the inlaid arrow! New-old-stock. Mint. 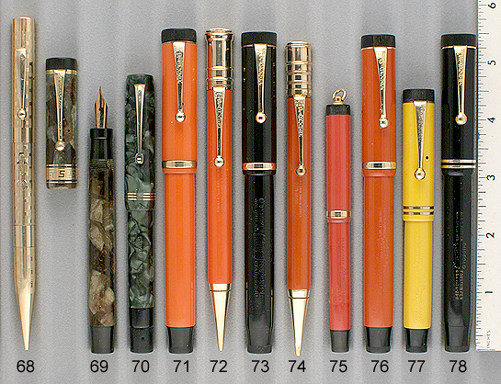 1970 Parker Pencil for above set. 1970 Parker Ball Pen for above set. 1972 Parker 65 Classic Flighter cartridge/converter fill in Stainless Steel. Unlike the 61, the 65 has a large non-hooded nib. Converter included. Medium/fine nib. New-old-stock, mint. 1976 Parker 61 “Stratus” cartridge/converter fill in Gold Filled. DOUBLE BROAD, ITALIC nib! New Old Stock – Mint. 1989 Parker Duofold International cartridge-converter fill in Cardinal. Original model with wider bottom cap band. Converter included. Medium nib. New-old-stock. Mint. Buy with Roller-ball below for $650. 1989 Parker Duofold Roller-Ball (International size) in Cardinal. Original model with wider bottom cap band. New-old-stock. Mint. Buy with fountain pen above for $650. 1938 Pelikan 110 PIF in White Rolled Gold. Extremely rare! Medium, flexible nib. A tad of wear to the cap lip, noticeable with a loop, otherwise near mint. No dents or dings. 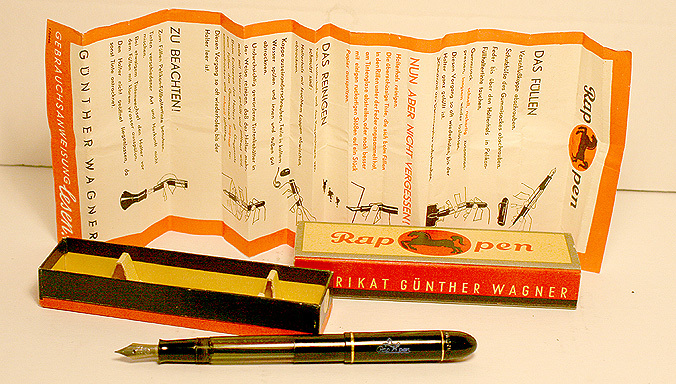 1939 Pelikan “Rappen” bulb-filler in Black. Green long visualated barrel window. Close-up Photo: New-old-stock, mint in original box with instructions. “Rappen” imprinted on cap in blue lettering. Medium, flexible “IBIS CN” nib (correct for the pen in 1939). 1939 Pelikan IBIS PIF in Black. GFT. Visualated barrel. Close-up Photo: Near mint+ in original box. Broad “IBIS CN” nib. 1939 Pelikan 201 Repeater Pencil in Tortoise. GFT. New-old-stock, mint. 1948 Pelikan 100N Emege PIF in Black. GFT. Barrel imprinted for the Portuguese market (“Emege” stands for the letters “M” and “G.” The Portugal distributor was Mr. Monteiro Guimaraes). Very rare and collectable. Fine, flexible, italic nib (other nibs available). Near mint. 1950 Pelikan 400 PIF Set in GREY striped (much much rarer than green or brown striped or black!). GFT. Extra-flexible “OM” (oblique medium) nib (other nibs available on request). Near mint. 1950 Pelikan Pencil for above set. 1951 Pelikan 500 PIF in Brown Striped. Gold-filled cap with alternating pinstripe and plain panels. The gold-filled turning knob is only found on the 500 (not the 500N or 500NN). Medium, extra-flexible nib (other nibs available). A few pinpoint dings in the cap (reflected in the price), otherwise near mint. 1953 Pelikan Pencil for above set. 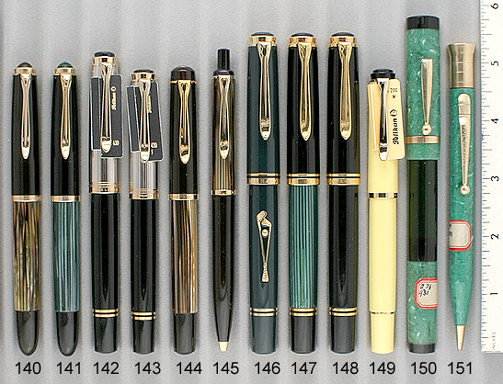 1957 Pelikan 400NN PIF in Green Striped. GFT. Medium, flexible, italic nib. 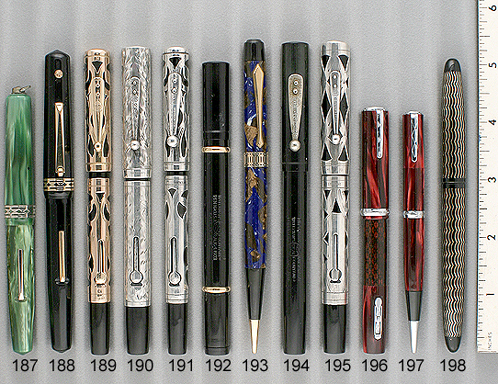 Several available, and ask for the nib you would like. Near mint. 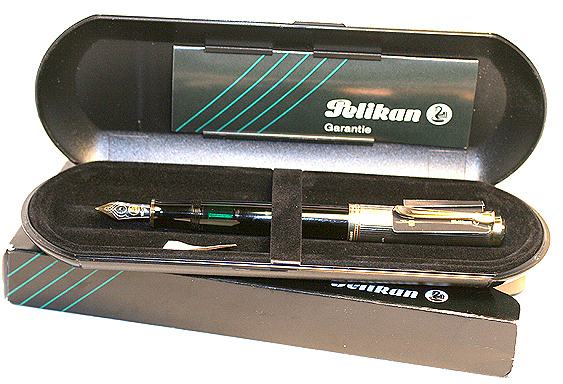 1995 Pelikan M100 PIF Set in Brown Striped with Brown Cap. Rare color, I believe made in M100 model for the Italian market. No longer available. GPT. 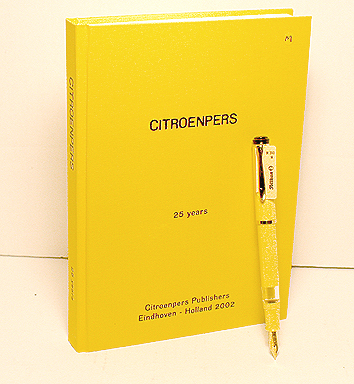 Gold-plated, medium nib. 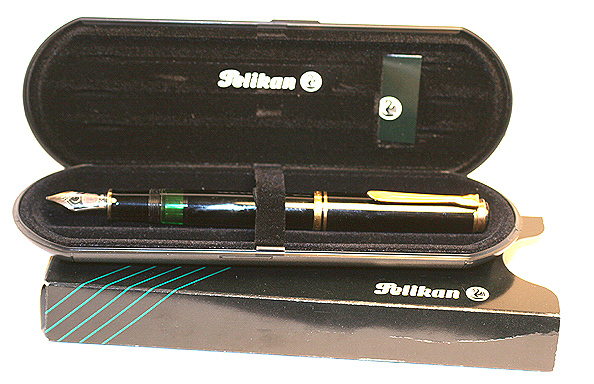 1996 Pelikan M1000 PIF “Golf” Limited Edition 3074/4500. GPT. Gilded putters on the shaft. Medium nib. No box, no papers, lightly used. Near mint. 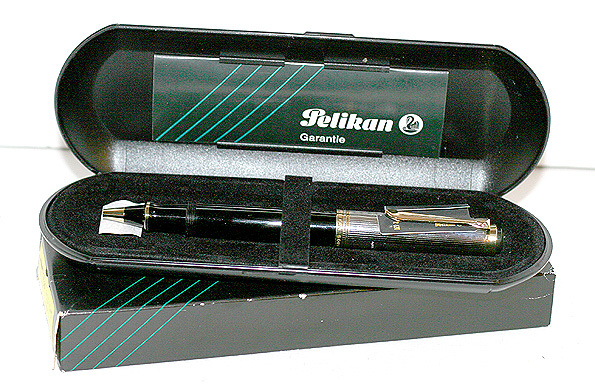 2000 Pelikan M800 PIF in Black. GPT. Broad nib. Close-up Photo: New-old-stock, mint in original box with instructions. List price $389. 1926 Postal/ Bonded #8 Bulb Fill “Reservoir Pen” Set in Jade. This was a Salesman sample or prototype set — both pieces with factory label model numbers. 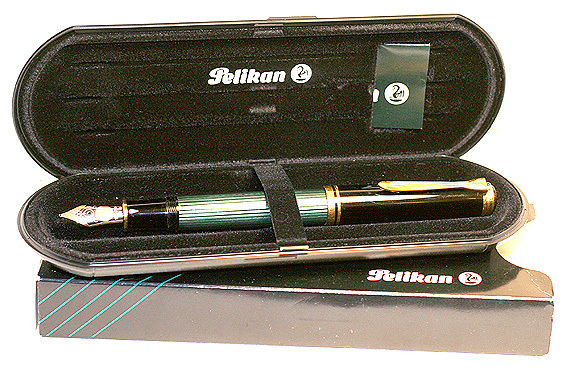 Pen has a long, translucent green visualated barrel and black bottom. I have not changed the semi-hard bulb, trying to keep the set original (but will do so at the buyer’s request). Fine, flexible nib. Pencil not working and is included at no cost. New-old-stock, mint. 1926 Postal/Bonded Pencil for above set. 1924 Sheaffer 46 Special LF in Jade. GFT. Medium nib. A tad of clip ball brassing, otherwise near mint. 1926 Sheaffer Pencil in Deep Jade. GFT. 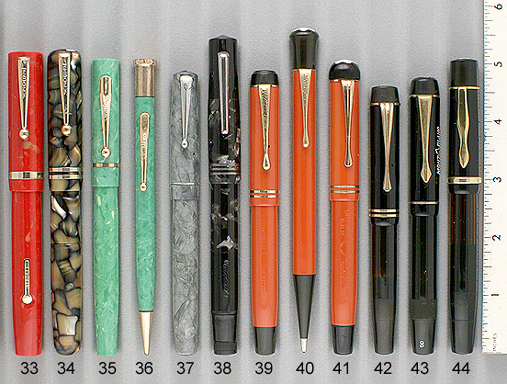 Companion to pen above, although the barrel pattern does not contain as much of the lighter shades of jade. No brassing or discolor anywhere. The derby is a degree or two out-of-round in one spot. Buy with pen above for $300. 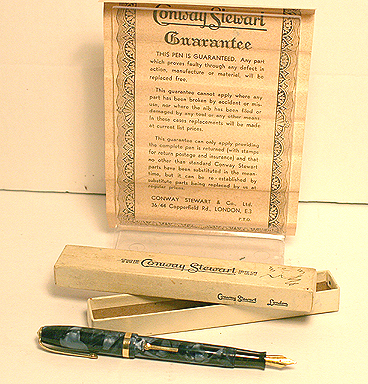 1930 Sheaffer Lifetime Oversize Balance in Black. The extra-long version of the large Balance. GFT. Medium/fine nib. A tad of band brassing, otherwise near mint. 1933 Sheaffer Lifetime Balance Large LF in Red Veined Grey. GFT. Fine point. Near mint. 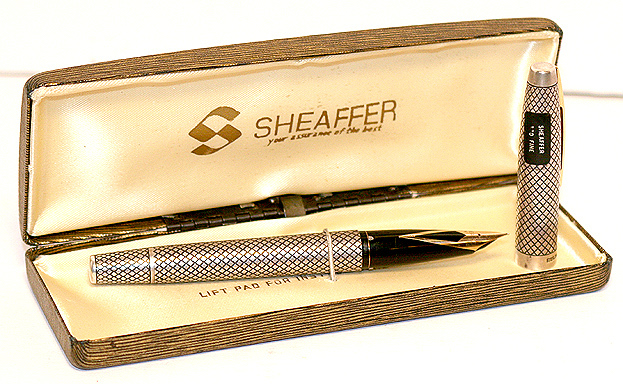 1945 Sheaffer Lifetime Masterpiece LF in 14K. Alternating pinstripe and plain panels. Medium/fine nib. One non-noticeable ding near (but not on) the near top of the cap, otherwise near mint. 1959 Sheaffer Imperial 320 Touchdown-fill in Sterling Silver Cross Hatch. 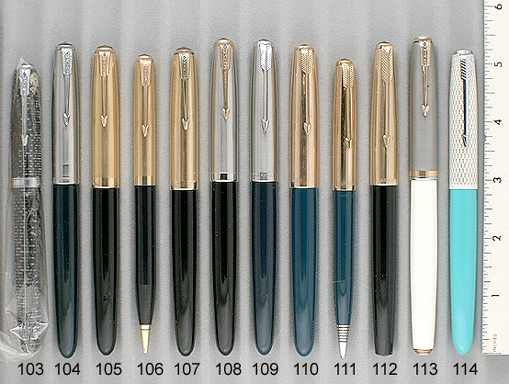 This was Sheaffer’s answer to the Parker 75 (and a very good answer!). Medium nib, with a tad of flex. Close-up Photo: New-old-stock, mint in original box with original label on the back of the cap. 1933 Soennecken 305 BF in Black Hard Rubber. GFT. BHR Soenneckens are quite rare. Wonderful broad, extra-flexible, oblique nib (left foot – for right handed writer). Near mint. 1927 Wahl Eversharp Gold Seal Personal Point Set in Green & Bronze. GFT. “Soldier” clip which sits low in the pocket. Extra-smooth, medium/fine nib. Near mint. 1927 Wahl Eversharp Pencil for above set. 1939 Wahl Eversharp Doric Gold Seal Personal Point LF in Black. GFT. Extra-smooth. Medium/fine nib. A few minor surface scratches, otherwise near mint. 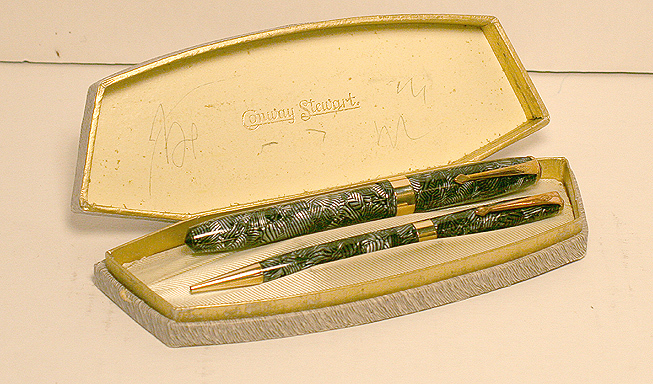 1915 Waterman 552 ½ LF in 14K gold overlay. “Filigree” pattern. Extra-broad, italic nib. Indicia engraved “S.E.L.” Near mint. 1915 Waterman 452 LF in Sterling Silver. “Hand Engraved Vine” pattern. Fine, flexible nib. Indicia engraved: “FJW” Logo on lever a tad worn, otherwise no visible defects. 1933 Waterman 452 LF in Sterling Silver. “Basket Weave” pattern. Unusual later version with narrow sterling silver clip and sterling silver non-logo “spade” lever. Fine, extra-flexible, italic nib. Near mint. 1936 Waterman Lady Patricia Ink-View Set in Red Lace. Chrome-plated trim. Fine, flexible nib. A tad of trim wear, otherwise near mint. 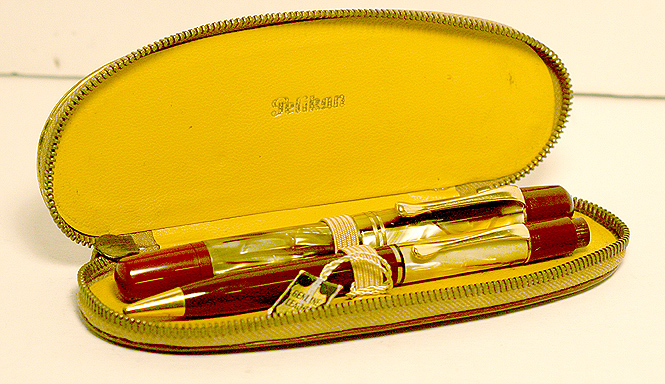 1936 Waterman Pencil for above set.